However, not only are there many styles within the Victorian period, there are styles from other periods that overlap with the Victorian. So, while there are, say, many vernacular homes that had, or may still have, “Queen Anne” ornament (the style people often associate with Victorian), there aren’t so many Second Empire buildings left here. 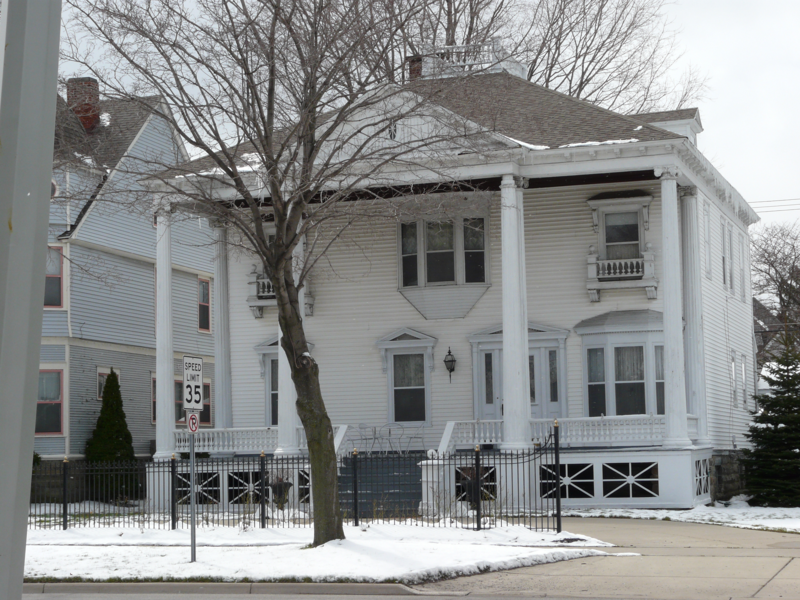 If all the Second Empire homes remaining in Port Huron were razed, it would equal only a small percent of all those remaining from the 2nd half of the 19th century. Knowing this, once a building is identified as a rarer type and not just another “Victorian,” then it is hoped that it will be favored with benevolence in its future. And Second Empire style is rarer; the style is the oldest of the Victorian Period and Port Huron has already lost much of its significant and beautiful stock (see Image 1 and its caption). A great many Italiantes, an earlier period style that overlaps with Victorian, have also been lost due to fires and demolitions. Image 1. Early Victorian Period: Residence of James Goulden was a very fine example of the Second Empire style (Art Work of St. Clair County, 1893, no page). Since it is also featured in the county’s 1876 atlas, it was built before that book’s publication. It was formerly at Pine Grove and Glenwood Avenues, Port Huron. 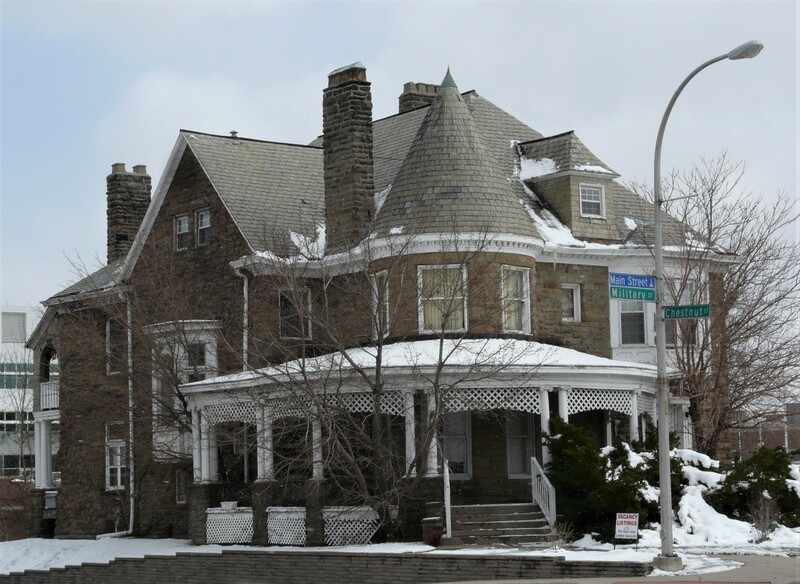 Other examples no longer standing are the Murphy Mansion (south Military Street), the Johnston(e)-Reed house (Wall & 6th Streets), the Howard House (Military St.), and pre-1876 home at 1317 7th Street. As can be deduced from the chart below (click on it to see a larger version), there were many architectural styles being built in the Victorian period. (Since the time periods overlap, the chart’s period headings are only generally placed.) Second Empire begins in about 1855, overlapping with all five of the Romantic Period styles listed. 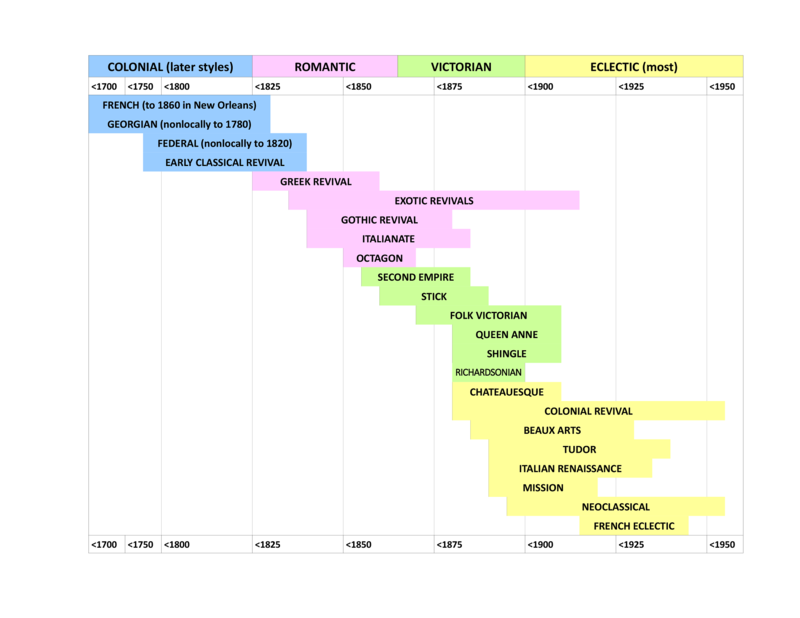 Folk Victorian (vernacular), Queen Anne, and Shingle styles all were built until the end of the period, about 1910, overlapping with seven of the next period’s styles (as shown on this chart; there are additional styles, and architectural historians differ, too, on what they consider separate styles and time periods for each). So as you can see, a great many structures built during the Victorian period aren’t “Victorian” at all, architecturally speaking. And there’s more! Because this chart was made to fit on one page, it doesn’t show other styles of the Modern persuasion, beginning around 1900, or the “Styled” houses starting in about 1935. Port Huron examples of many styles from the Victorian Period are provided below, including some from the other periods that overlap. Image 2. Produced by the author, the chart is almost solely based on the standard text used for architectural home styles, Virginia McAlester’s A Field Guide to American Houses (Alfred Knopf: 2015). Other sources of architectural styles may vary from McAlester’s names and dates. Image 3. Romantic Period: Probably an Italian Villa subtype of the Italianate, with much of the decorative elements removed or covered. 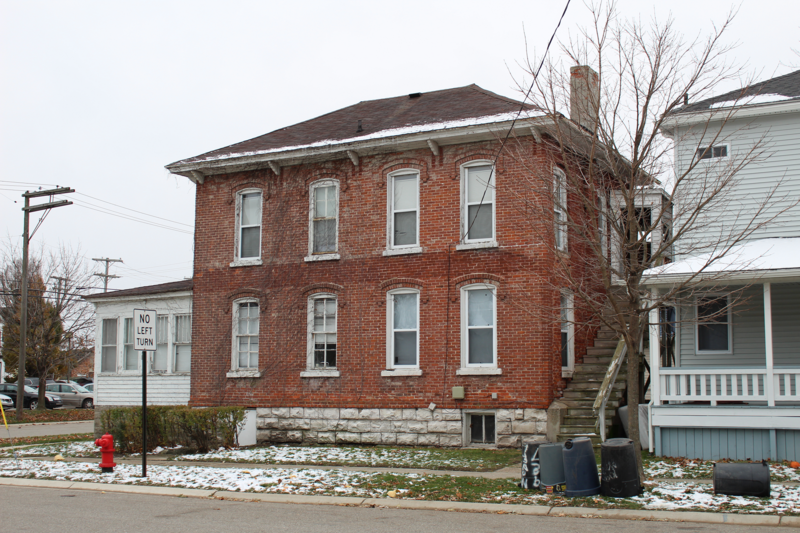 1013 Ontario Street, Port Huron (author photo, November 2018). Image 4. Romantic Period: Italianate, side view along Rawlins. Simple example with stone foundation and later porch and sun room addition. 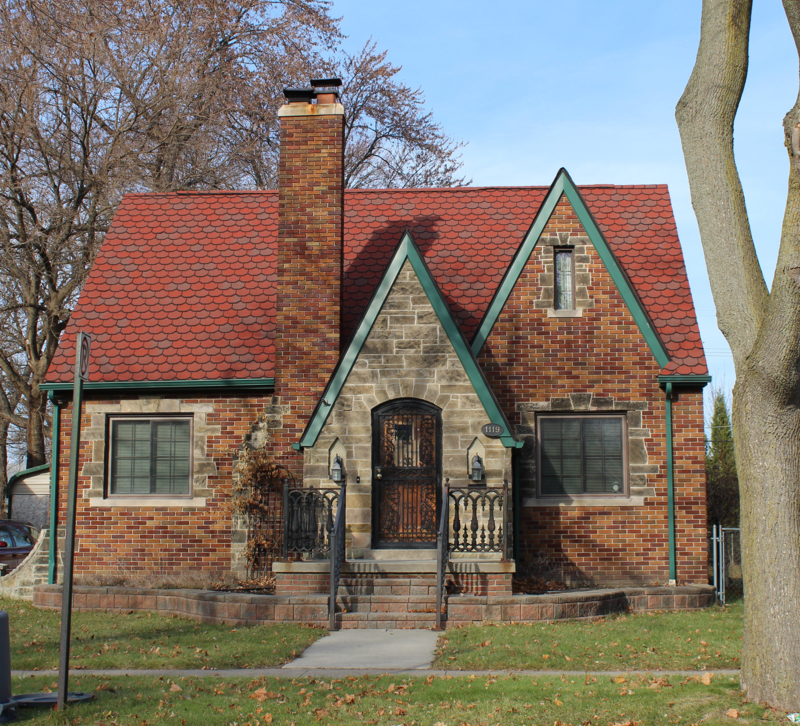 927 Ontario, Port Huron (author photo, November 2018). Image 5. 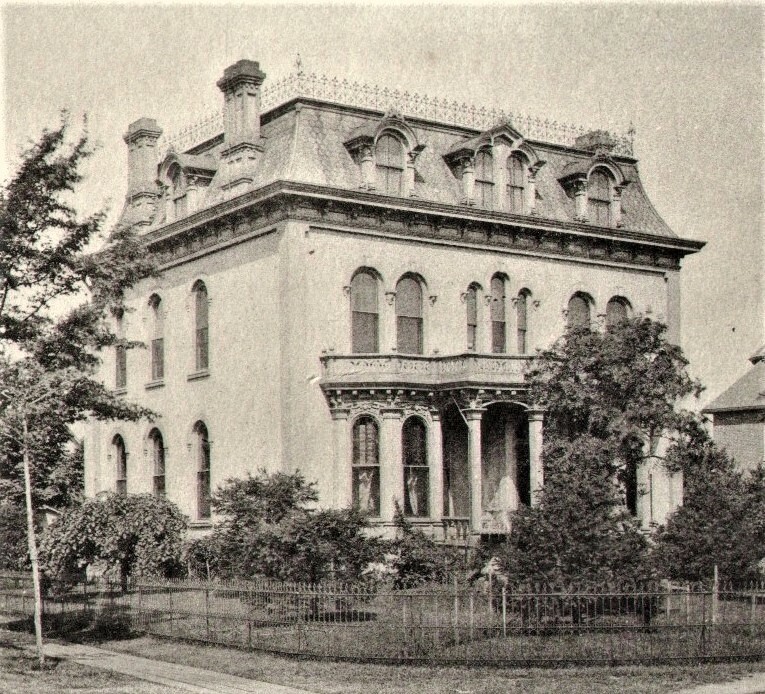 Victorian Period: Former residence of A. D. Bennett, 1412 Military St. From Art Work of St. Clair County (1893, no page). Shingle Style, and not just because it has shingles! Wide towers, often appearing as outgrowths of walls, are common. This amazing house stood in what is now just a grass field. 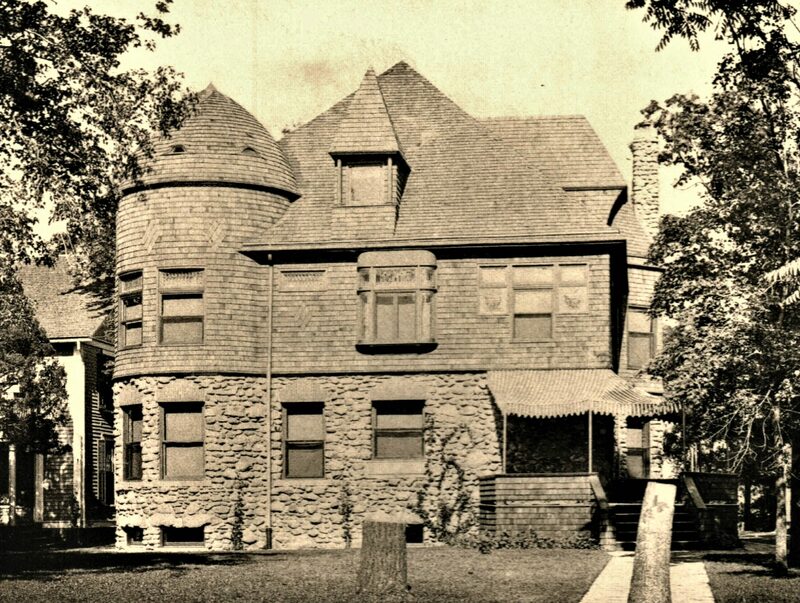 The Bennetts were almost neighbors to the Wests; Bina West, founder of the Woman’s Benefit Association, lived with her parents kitty-corner from the WBA building prior to her building her own large residence further south on Military. That large empty grassy area held some well-made and significant residences. Image 6. 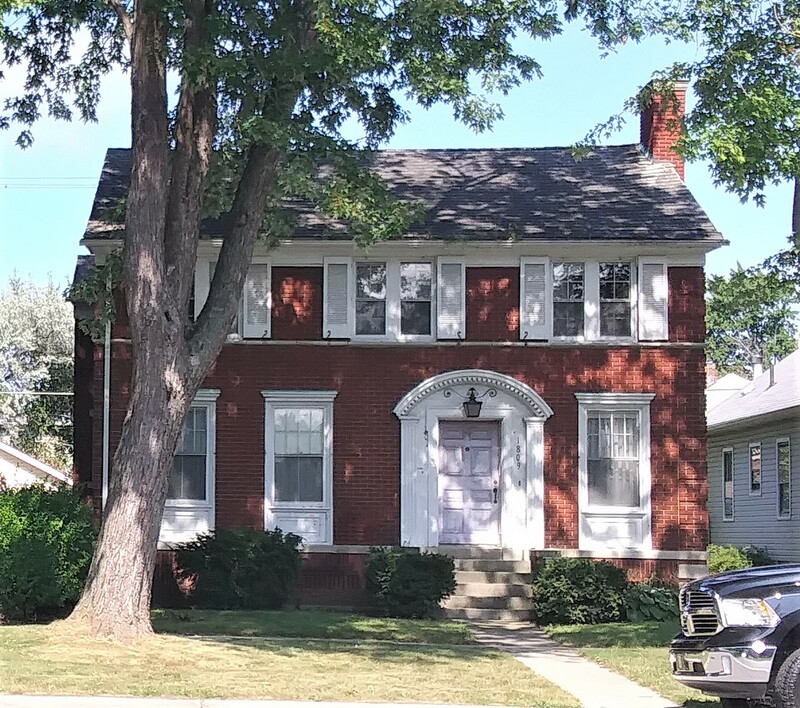 Victorian Period: Queen Anne style home at 1504 Chestnut St., Port Huron (author photo, early 2016). Queen Anne homes can be quite varied from each other. Image 7. Victorian Period: Richardsonian. Essentially a Queen Anne of stone. Military Street at Chestnut, Port Huron (author photo, early 2016). Image 8. Early Eclectic Movement: Colonial Revival, 1809 Griswold Street (author photo, fall 2018). Street (author photo, early 2016). Image 10. Eclectic Movement: Tudor, adorable subtype. No half-timbering here; not all Tudor’s have half-timbering. 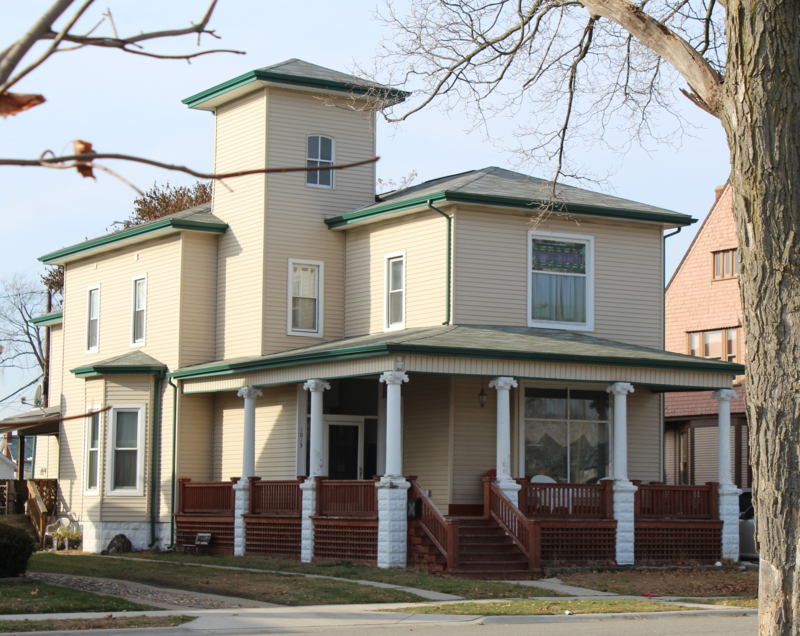 1119 Minnie Street, Port Huron (author photo, November 2018). Looking at these homes and thinking about the styles, wouldn’t it be nice to know how many there are of the various types? How many Italian Villas, Second Empires, Richardsonians, Mission styles (not shown here), Art (or Streamline) Modernes (also not shown here), etc., are there? Are there actually any intact Art Moderne homes in the city? Knowing these quantities is an important factor when considering the significance of a property for historic designation, and possibly other, history-related purposes. This is why conducting a survey of the homes in the city (and surrounding areas, too) is important. If you’re interested in helping with this task in Port Huron or the surrounding areas, please comment below (we will be able to reply using your email) or fill out the contact form. Thank you! Craven, Jackie. “American Victorian Architecture, Homes From 1840 to 1900.” ThoughtCo, Oct. 15, 2018, thoughtco.com/victorian-house-styles-1840-to-1900-178210. Craven, Jackie. “House Style Guide to the American Home.” ThoughtCo, May. 27, 2018, thoughtco.com/house-style-guide-american-home-4065233. Guter, Robert P. and Foster, Janet W. Building By the Book: Pattern-Book Architecture in New Jersey. Rutgers University Press, 1992. McAlester, Virginia Savage. A Field Guide to American Houses. Alfred A. Knopf, 2015. Roth, Leland M. A Concise History of American Architecture. Harper & Row, 1979. Whiffen, Marcus. American Architecture since 1780: A Guide to the Styles. The MIT Press, 1992. * This was originally published at Blue Water Healthy Living at the end of November, 2018. 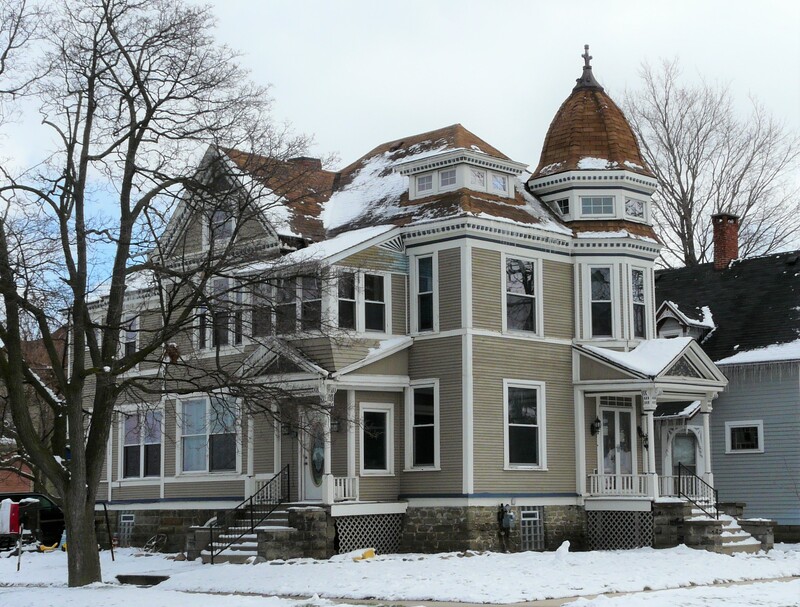 This entry was posted in Historic architecture, Historic Preservation, Michigan history, Port Huron, St. Clair County, Urban "renewal" and tagged historic preservation planning, port huron architecture, victorian period homes by porthuronhistory. Bookmark the permalink.